Version 3! After two different and unsuccessful attempts at a tribal sub theme I settled on a more controlling style for Gitrog, with lots of Edict-style effects. It’s been a much smoother ride. Demons make up the bulk of my heavy hitters, because they tend to have the punisher mechanics I was looking for. Originally I had only edict effects for removal, but my experience is that I really do need some targeted stuff too, so I’ve included a few. A few other notable insertions – Glacial Chasm, which, with Crucible of Worlds, you don’t even need to pay the upkeep for; Westvale Abbey for a big not-quite-land beater, and Pernicious Deed, which has been an all star so far. Last edited by Spectrar Ghost on 2016-Aug-22 9:27 pm, edited 3 times in total. Constant Mists and/or Worm Harvest might be reasonable stall tactics until your beasts get online, and Worm Harvest would certainly give you tons of tokens later on in the game. If you aren't looking for it to be too competitive, any of the Retrace cards would be fun. I couldn't help noting how particularly vile one of these decks would be with multiple dedicated land-sac outlets and Herald of Leshrac would be. I agree on Worm Harvest, it's good enough to include in any Golgari deck and it'll be stellar here. Also, any excuse to run Mazirek is good. Hermit Druid when you just want to draw a lot of cards, while fixing your mana while he's at it. It's at most 1 per activation, which is still pretty good. Don't know if you were implying you draw more than one or not. Also it's worth mentioning that any discard outlet like Putrid Imp goes infinite with Gitrog and Dakmor Salvage, but it looks like you're going for more of a big creature type deck than a combo deck. Well, you can tap the hermit every turn... It's unfortunate Hermit Druid is wearing the "KILL IT!!! IT'S A COMBO! KILL IT WITH FIRE!!!" t-shirt, because it's ridiculously good at fixing mana. Infinite? Dredge doesn't work once you have no cards in your library, does it? Drawing cards once you have no cards in your library doesn't sound so smart either. But besides that, even drawing a mere 10 cards or so sounds like a good deal. edge of autumn seems good here. Early ramp or draw 2 with Senōr Frog on the battlefield. The Git has plenty of Velocity, verging on excessive while Horn of Greed is in play. Despite having a whole suite of beasts to back him up, he struggles to play threats effectively. This is mostly because he can't count on having more than 5 lands, since he keeps eating them. With an average CMC 0f 3.6, and an average CMC of the included beast and beast related creatures of 5.16, he just never builds steam. 1) Land Ramp. I thought I'd be able to keep the lands flowing without spell-based ramp, but it seems this is not the case. I need to add some. 2) Zombies. I think I need to refocus the threats on a less expensive tribe. Zombies also have the advantage of built in recursion in many cases, allowing them to more effectively weather some of the selection spells I've included that effectively self mill. 3) Answers. They just never quite made it into the original list (a relatively common occurrance for me while I evaluate a decks mechanical potential). I need to include a few bits of spot removal. Fortunately I'm in reasonable colors for everything but Enchantmemnts. I was playing around with a Gitrog deck. One card that I found good is Drownyard Temple. Being able to get it back after saving it to the toad is nice and it combos well with dustbowl. Also since you can drop so many extra lands cards that get lands into your hand go up in value. Nissa's Pilgrimage has been good. Also fun are cartographer effects, especially Tilling Treefolk. This is mostly because he can't count on having more than 5 lands, since he keeps eating them. With an average CMC 0f 3.6, and an average CMC of the included beast and beast related creatures of 5.16, he just never builds steam. - Reanimator: makes perfect sense in these colors. 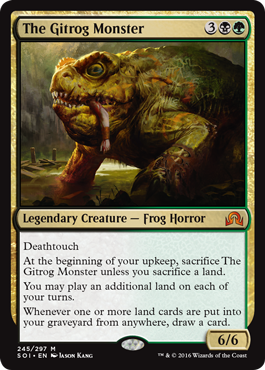 The problem with Reanimator is running out of gas, but Gitrog Monster should solve that. You could go Horror tribal. - Cheap stuff that returns from the grave, like Bloodghast, Gravecrawler. Use these to fuel Perilous Forays. There's some overlap with zombie tribal here. Or just go Voltron. Big body, card advantage, that should work. A bit boring though, but you could disguise it as a horror tribal deck. The OP has been updated with a new version, retaining just under 60% commonality. I went Zombie Tribal. Might need to get another Perilous Forays eventually, my only one is in Omnath. I looked at it closely. I may still put it in later. Dakmor Salvage outclasses it in a big way, since it costs nothing to return, and also nets you a card ~2/3 of the time. Horn of Greed + Gitrog is insane. If you can keep the lands flowing you're looking at 4+ cards a turn. Remember that discarding a land is a cantrip, too. So I'm looking at Zombie Infestation as if it says "discard two cards: put a 2/2 Zombie token onto the battlefield. Draw a card" Necromancer's Stockpile just replaces a discard with a mana cost. Stockpile is better, but not strictly so. Praetor's Counsel?